Ótimo para folhas de outono 🍁 City Overlook está localizado na cidade logo acima do centro de Chattanooga, em um terreno arborizado rústico, isolado 2. 5 hectares. Festas e eventos estritamente proibidos. Esta propriedade tem acesso imediato ao centro da cidade e interestadual (I-24), e está convenientemente posicionada entre o centro e Hamilton Place Mall. O chalé do segundo andar tem uma parede única de janelas emoldurando vistas do centro de Chattanooga, Mnt Lookout, e Signal Mnt, e é um lugar ensolarado brilhante para ser no outono e inverno. O espaço tem pisos de madeira na sala de estar, lareira a gás, aparelhos inoxidável, decoração contemporânea, varanda coberta privativa nas árvores, e aprox. 1300 pés quadrados de espaço vivo, com uma cozinha totalmente equipada. EPB fibra óptica wi-fi. A moradia tem dois grandes quartos acarpetados, ambos com colchões de espuma de memória, com 400 lençóis de algodão egípcio contam com ameaça. O chalé é um grande apartamento de um nível construído em cima de uma residência privada que eu possa ficar ocasionalmente. A moradia está localizada por uma estrada de cascalho longa e estreita que é um pouco áspera e pode ser lamacenta. A entrada de automóveis pode ser difícil de se virar. A moradia está em um lote arborizado natural com grama mínima e paisagismo. Esta localização é apenas acima do centro para que você possa ouvir o ruído da cidade e do tráfego à distância. Nota: Sou flexível com um depósito ou seguro reembolsável. O padrão é configurado para um depósito reembolsável. Deixe-me saber o que você está procurando ou se você tiver alguma dúvida específica. This property was very clean and very well appointed. Decor was sleek and modern. We enjoyed the gas fireplace one evening. It does feel as though the property is leaning down the ridge a bit, as an object rolled from the bedroom door will go downhill to the front of the house. This is more pronounced on the deck. 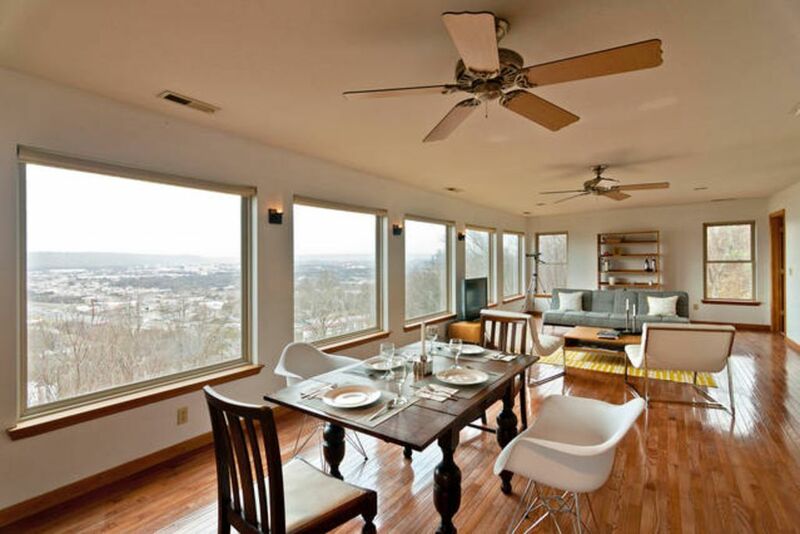 But overall, this is a wonderful property with easy access to the main highway through Chattanooga. The switchback driveway is easy to miss, but it does make for unparalleled privacy. And the view of the city is gorgeous, both night and day. Extremely clean and well accommodated. Located super close to several great restaurants. Thank you for your hospitality. My husband and I stayed here to celebrate our wedding anniversary. Our only regret about this place was that we couldn't stay longer. It is as gorgeous as the pictures, and the views are as fabulous as they look. Plus, you're a $14 round-trip Uber ride away from great restaurants while feeling like you're getting away from it all. The place was definitely clean. The master bed was comfy. There was everything I needed to make coffee the way I like it in the morning. And it was really quiet. Yes, there is highway noise outside, but it is negligible inside and not a big deal even out on the balcony. The decor is a tasteful and intentional modern theme, which allowed the views to really take center stage. We had no issues and would love to come back and stay here! Things you should know: The second bedroom is a bit further away from the shared bathroom, which has a door from the main area and the master bedroom. There is no (or only basic?) cable, but if you bring an HDMI cable, you can hook up your laptop to stream whatever or use the DVD or Blu-ray player. And as other reviewers have mentioned, turning around in the driveway is a challenge but if you have a back-up camera, you're fine. Also, you will say to yourself several times: I wish we could put our bed out in the living room so we could wake up/go to sleep to that view!!! Chattanooga-related: We recommend the Flying Squirrel and Feed Co for dinners and the Maple Street Biscuit Company for brunch. They were all excellent! Ruby Falls was not worth the wait (I know! It's super touristy...). Rock City was a pleasant afternoon activity until we got to the Fairyland, which was super creepy. The 4 Bridges Half Marathon was beautiful and we definitely recommend it! We would love to come back to Chattanooga again. The place is modern, beautiful with gorgeous view of the city day or night. We really enjoyed our stay here. It’s private and about a 10minute drive to downtown Chattanooga. There is a market not far from the place. Not a big deal really, but I gave it a 4 star because you can hear the cars and motorcycles inside the house. It’s tolerable. We will definitely get this place again next time we’re in Chattanooga ! Highly recommend. We absolutely loved our stay here- it was perfect and exactly as pictured/described! The views of downtown are fantastic using the telescope provided, and at night the city sparkles. The location is wonderful and very accessible to downtown and all of the tourist spots, but still hidden away and peaceful. Inside the Hideaway it is nicely decorated and well stocked- we really appreciated the little touches including the complimentary bottle of wine, lovely candles and toiletries. We will be back! Absolutely no parties, gatherings, or event at property. No Smoking or Pets! Occupancy is strictly enforced and violators of policies will be charged. 2 night minimum when fewer nights remain on calendar. Check in time is 3:00 pm or after. Checkout time is 11:00am. Because the windows are so large, the sunshades need to be pulled in the afternoon or the chalet may not cool down.